A Time magazine reader asks, Is it more important to be respected or feared? "If we lived in a utopian world, it would be better to be respected. But since we don't, it's better to be feared. I like being both, but [if I had to choose], I would like to be respected. Respect is more powerful than love." 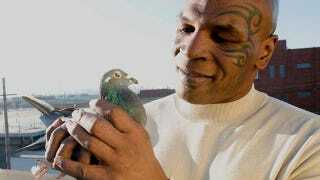 Tyson's new show about pigeons premieres Sunday on Animal Planet.